Team Archery Adventure - get the group together, aim and fire! According to Encyclopedia Britannica, archery’s importance as a cultural advance ranks with the development of speed and the art of making fire. The use of the bow appears in folklore from over 3000 years ago, although its invention probably predates that era. This activity is amazing and always gets the group in high spirits; it involves self confidence, skill and a keen eye! We provide everything you need to experience archery from a quick have a go to a full tournament. Just wear some comfortable outdoor clothing and suitable footwear. 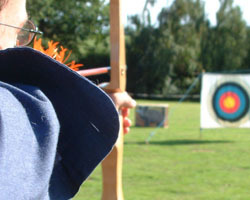 Archery can be done as a full or half-day session to form part of a multi-activity adventure. If you would like to learn the art of firing an arrow and scoring a bulls eye then contact our team today for more information about our archery courses. Each archery class has been broken down into fun lessons that contain a number of archery games and exciting challenges to put you on target. 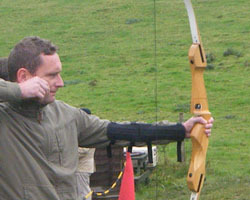 Archery can be great for corporate groups, participants can be split into teams or play as individuals. Tournaments with scoring can be arranged for a competitive edge. Archery can be great for stag weekends. Stags can participate as individuals or teams with competitive rewards, maybe beer tokens! Hen Parties will really enjoy archery. It is great fun and really gets the group into high spirits. Young people really enjoy archery. It teaches discipline and accuracy. Splitting into smaller groups can really encourage teamwork and cooperation.